As a parent, you can easily dread trips to the grocery store. First, you have to bundle up your kids, make the drive to the store, and then find a way to get everything on your shopping list while keeping your kids in line. A trip to the grocery store is especially challenging if you have a toddler. If you need to bring your toddler with you to the grocery store, these tips will help you survive your trip. Keeping your toddler entertained in the grocery store will help you survive your trip. You should pick something that will keep them occupied and engaged for the entire time that you’ll be at the store. Bring a favorite toy or stuffed animal or even a family tablet for some learning games. You probably give your toddler a snack or meal before heading out to the store, but don’t forget to pack a few snacks for the road, too. If your toddler starts to get hungry at the store, you’ll probably be more concerned with feeding your child than making sure you get everything on your grocery list. By packing some snacks, you’ll have something that you can quickly pull out to satisfy your toddler until you get home. Before going to the grocery store, have your toddler take a nap first. Tired toddlers tend to be grumpy, which can lead to an unsuccessful trip to the store. You know your toddler best, so it’s up to you how long the nap should be. Give your child enough time to wake up after the nap, and then head to the grocery store. Toddlers will throw a tantrum over anything and the store presents lots of opportunities. You can head this off by having a quick chat before you leave. Just lay out all of your expectations in order to at least come to an understanding prior to arrival. If you need to bring your toddler with you to the grocery store, don’t have a shopping marathon. Pick just one or two stores that you absolutely need to go to and then go right back home. The more stores you try to fit in, the more likely it is that your toddler will have a meltdown or that something will go wrong. Make the shopping trip fun for your toddler by playing simple games like iSpy, for example, iSpy a blue colored box on the shelf. You can ask them to count the items as you place them in the cart. You can have your child take items off the shelf and hand them to you. Have them help you pick fresh produce like apples and place them in a plastic bag. Going to the grocery store with your toddler might not be fun or you, but it is possible to survive your shopping trip. 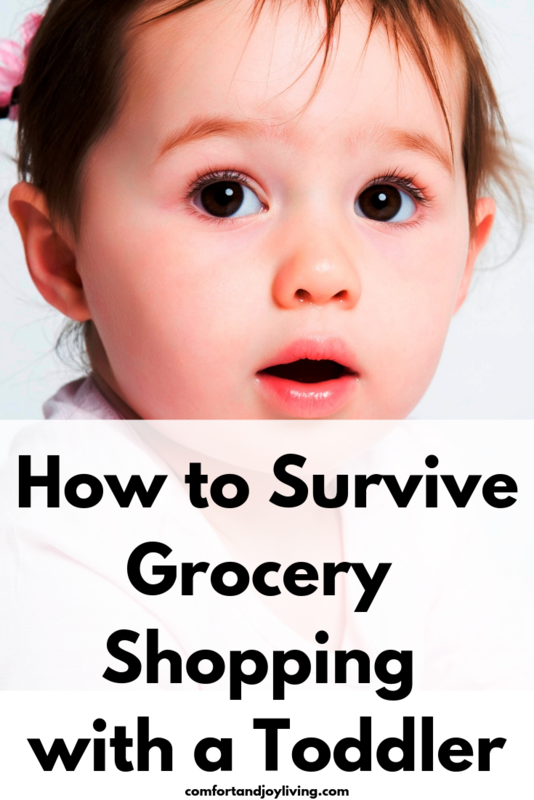 What are some tips you have for surviving the grocery store with your toddler?